Skunks are not a welcome addition to anyone's family. Cayuga Creek Nuisance Wildlife Removal is the Buffalo area leader in skunk removal, skunk control, and skunk trapping in the greater Buffalo, and Erie county area. 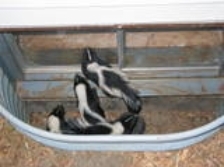 We know skunks, where they den, where the feed, their mating habits and travel habits. If skunks are living under your porch, under your deck, or under your shed, give us a call. Don't let Pepe Le Pew ruin your outdoor plans, we can safetly remove nuisance skunks, and offer long term solutions, so skunks never stink up your plans again. The striped skunk is found throughout New York State. It typically ranges in size from 20 to 30 inches long, including a 10 to 15 inch tail. Their weight can range from 6 to 12 pounds. Skunks can commonly reach densities of 50 animals per square mile. In suburban areas skunks commonly den under porches, steps, patios, decks, barns and sheds. Visual sighting of the animal. Although nocturnal skunks are frequently seen at dawn and dusk. Skunk tracks are small and will show all five toes with a smooth palm and pads. Skunk odor is the most common sign of skunk presence. Skunks emit a nauseating, strong, penetrating musk. 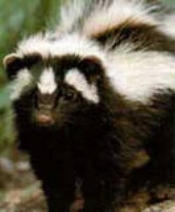 Skunk odor sticks to water vapor, meaning during times of heavy dew, or rain, skunk smell will intensify. Skunks commonly damage lawns while foraging for grubs. They will dig small 3-4 inch holes while feeding and can cause extensive lawn damage in the process. Skunks can spray between 10 and 15 feet. Prior to spraying skunks normally display signs of aggravation, such as turning away from its aggressor and stomping its front feet. Skunks will turn their body in a U shape when spraying so they can see what they are spraying.